Give your fish nothing but THE VERY BEST FEED. Providing your fish with a high quality food like the Aquamax Sportfish MVP will improve growth weight and lower the amount of nutrient waste. Lower grade foods do NOT produce the same results. Excellent food source for carnivorous species like largemouth bass, hybrid striped bass, bluegill sunfish, and rainbow trout. Multiple Particle Sizes To Allow Different Sized Fish To Feed. Mix Of Sinking & Floating Feed Expands Feeding Area To Allow Smaller Fish To Grow. Great premium feed to fill your automated fish feeders! 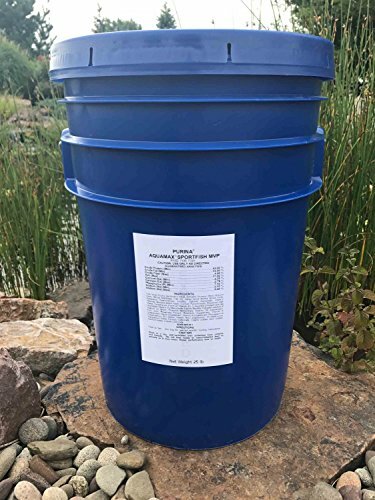 Aquamax Sportfish MVP Contents: 9 Particle Sizes Ranging From 1/8" to 9/32" 3 Smallest Particles are 50% sinking feed, the remaining particles float 100% First Ingredient is Fishmeal Crude Protein: 43% Crude Fat: 12% Crude Fiber: 4% Calcium: Min- 2.25% Max- 2.75% Phosphorus: 1.10% Salt: Min- 0.10% Max- 0.60% Ash: 11% Consumption varies based on water temperature, time of the year, nutritional needs of the fish, other available food sources, and fish familiarity with particle feeds. Includes Resealable Bag To Keep Food Fresh. If you have any questions about this product by Aquamax, contact us by completing and submitting the form below. If you are looking for a specif part number, please include it with your message.